Taking a break from some of my other stuff to do something new. The idea is basically to make a non-violent X-com. Take everything you love about X-com and then turn it into a wholesome, positive, uplifting game about Mankind coming together and doing something wonderful. No aliens, no evil government plots, none of that. Just... X-com meets Sesame street. In space. With that out of the way, I'd like some feedback on the general structure of this mockup, particularly in regards to perspective in the foreground and what to do with the background. Pretty much everything is just a crude placeholder, so I don't need to know if the buildings, the GUI or the space shuttle have a poor design. Those will all be rebuilt and redesigned when I'm sure that I have the right direction. In regards to the background, keep in mind that this is a space station orbiting earth. So I'm not sure if I should let the surface of the earth cover the entire background, or let the background be just empty space with stars and nebulae, or if I should keep it similar to what I have here. EDIT: Also, I don't speak or read Russian, so if Google Translate has fumbled me up, let me know, please! I would suggest a horizon line that parallaxes with the screen to indicate the roundness of earth (or whatever planet). The stars are mandatory to keep people aware that this is space and some hint of the planet below should be present, though not obscured to the point you can't tell what it is. Just because the title screen says you're in space or the story says you're above the earth, if the game doesn't say it with the visuals while you're playing, you've failed. Looking at this objectively, I can't tell at all that these guys are in space since the blue could easily be water. There's no hint of roundness, land formations and/or clouds or anything that says this is way in the air. Without you telling me directly, a simple squiggle doesn't do enough to tell my brain that I'm in space, even if there are a few stars above the construction area. You could add a light cast on the planet by the sun to give a bit of an indication of roundness of the sphere below. I think that would help this tremendously. Outside of these things, I can't speak on anything else as far as the effectiveness of the GUI or anything since I've never heard of X-com before this. Hopefully what I did provide will help though. 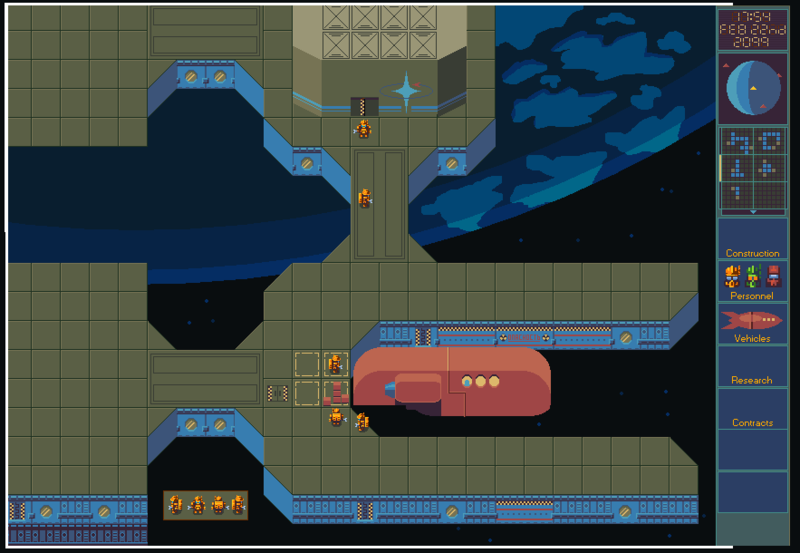 perspectivical clash of topdown square tiles and iso cubes and flat frontal seen chars/ships isn't really optimal. Thanks, guys! Very helpful indeed, although I'm not sure I was able to address your criticism properly. Just to clarify: The spaceship is a very, very crude isometric oblique mockup. A place-holder, basically. Are you sure you mean isometric? This looks more like rpg perspective. Not bad, but the landmasses should have a few connected to one another instead of them all being uniformly-sized/spaced out like that. Just doesn't look natural. In addition, you should think about adding some sense of atmosphere/clouds to the planet (i.e. a glow around the outer edge of the planet where the floating dust/gas particles grab stray light and reflect it back at the observer to show there's an atmosphere, and some semi-transparent cloud striations across the surface at a smaller scale than the land masses, perhaps with shadows on the land masses to indicate some sense of their height as well). You might also want to consider adding a bright star here and there in your sky at least. Space is full of 'em. one thing ive noticed as well, to me it looks like the floor tiles are lit from the top left, whereas the sides of the platforms are lit from the bottom left. I suppose you can be creative in space though! have you thought about what the light source is? @ Probo: Well, I'm a total noob when it comes to this sort of pixel art, but my intention was to have the light source above and from top left-ish. However, we can't really see the bright side of any buildings (their "top left side"), so while that side would be brighter, we can't really see anything from this side. But I figured that the bottom left side of buildings would still be brighter than bottom right side, because bottom right is on the opposite side of the light source, and so would be darkest. Does that make sense? Thanks, I see what you're saying. I've made adjustments accordingly, although I'm now thinking that I will also need to change the background completely considering the light source. If the light source is above, then this side of the planet can't be dark. However, I wanted it to be dark in order to make it a dark contrast and a good background for the base. Anyway, here's what I've got now.